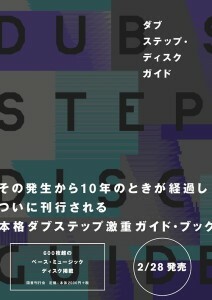 A book named “Dubstep Disc Guide” will be on sale on 27th February. I take charge of a part of the disc reviewes, which a writer Takaoka, one day, emailed me asking. What’s more, the interview that I participated in with Dx from Soi and E-Jima from Discshop Zero that had suggested me to join it, is also included. The editor of this book Maeda asks us about Post Dubstep in the interview. Another interview with Pearson Sound taken by Takaoka when he was at Unit to play DJ as well. There are, too, many intriguing contents that I do not concern with.